Hearos, one of the most successful and well-loved foam ear plug manufacturers in the world, now brings us the F4 Series reusable ear plug. While it's not the first reusable ear plug from Hearos, it may be the most innovative. What sets the Hearos F4 apart is its 2-dome, 2-disk-flange tip. 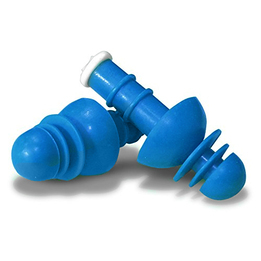 Dome shaped tips and plugs with multiple flanges are both par for the course when it comes to reusable ear plugs, but the F4's configuration is new. All reusable ear plugs are seeking one goal -- the perfect fit -- and the F4 soars ahead to meet that goal. Each of the domes and flanges on the F4 serve to create an effective seal all the way around the inside of the ear canal. Getting that proper seal against noise is essential; it's what makes the ear plugs able to block their fully-rated NRR 27 protection from sound. That same proper fit is also responsible for ensuring the ear plugs seat comfortably in the ear canals. The F4 has four potential sealing points - 2 domes and 2 flanges - to establish and maintain an effective and comfortable fit that will last all day, even in demanding industrial workplaces. Hearos F4 Series ear plugs are quick and easy to insert. A gentle push will usually do the trick; adding a little twist to that gentle push motion can help get the plugs seated just right. These ear plugs are reusable, and they can even be washed in a little warm water and soap to increase their lifespan. Available in corded and uncorded.